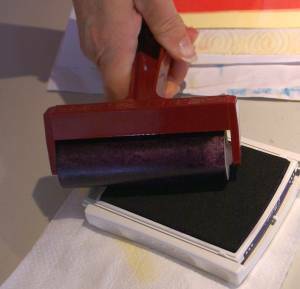 Do you have a brayer but are not sure how to use it? Here are some of my tips! "Ink and paper, paint and paper, you can use it all with a roller in your hand!" When I first got my own little rubber roller I was at a loss about how to use it. I think this could be a common experience for new crafters. 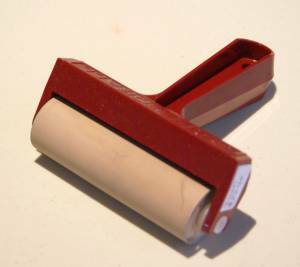 All of my previous experience with rollers had been house paint rollers. I tell you, they are very different from this tool, though some of that experience is useful too! These days it is a handy tool that couldn't be easier to use. I'll tell you what I have learned about it so far. 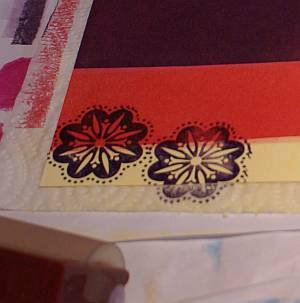 A rubber brayer is a very useful tool for stamping, mixed media and scrap booking projects. It is a papercraft tool that looks like a small paint roller made of rubber instead of sheepskin. Because it is rubber, you can treat it like your rubber stamps and use ink or paint on it. Just as there are many different ways to use stamps, there are many applications for this tool. Sponge brayers are papercraft tools made by Stampin' Up! These tools are essentially similar but smaller than the rubber one pictured above and the barrel is made of white sponge. They are more giving than rubber barrels. You use them the same way though. To change colours, you snap out the sponge part and replace it with a clean sponge barrel. You can then rinse and clean the sponge barrels with water if you use a water soluble ink. If you use a lighter coloured ink, it may not look as though the sponge barrel is picking much colour up, but you will find it actually is picking up plenty of ink. 2. Roll the clean barrel over the pad in one direction, lift off the pad and start again, rolling over the whole pad. You do it this way because if you push the roller back and forth across the ink pad you will ink up only one section of it. 3. Roll the ink onto your paper or cardstock in one continuous motion first, then roll back and forth over the area to spread out the ink and enrich the colour, gaining every bit of use out of your ink and to make the result more even. 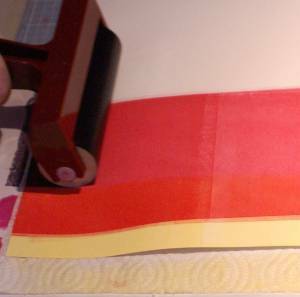 Here I stamped in Stazon over my background after I laid the yellow and red colours down. When overlapping colours, remember that two colours mixed together will make a third, so decide if you want that effect or need to lay the different colours next to each other rather than overlapping them. If you want to avoid mixing colours, use a piece of scrap paper as a mask. If your roller is made of foam, you can wash it under running water and use some mild dish washing detergent to remove all the ink and paint possible. However you clean the roller, I recommend running it over some scrap paper afterward to ensure you have removed as much of the medium as possible and dried the roller off. Otherwise your next project could turn out to be a different colour than you wanted! 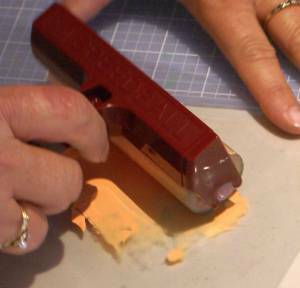 Now you have the basics for using and cleaning a brayer, why not try some of the other ways of using it for your next project? 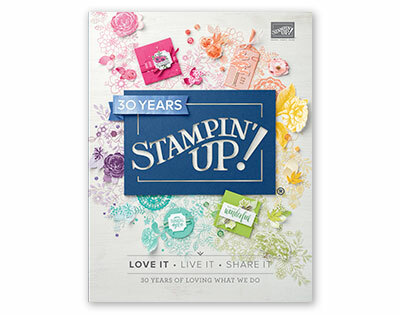 If you don't have a brayer yet and live in Australia, you can buy foam ones from my Stampin' Up! store or click on the catalogue link in the right hand margin. 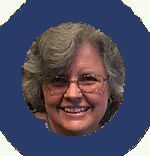 Read more about my life as PaperCraftCentral Susan here.